In this interview, we learn more about the man behind the Classic Tetris World Championship. In 2010, an intriguing documentary was being filmed called Ecstasy of Order: The Tetris Masters. 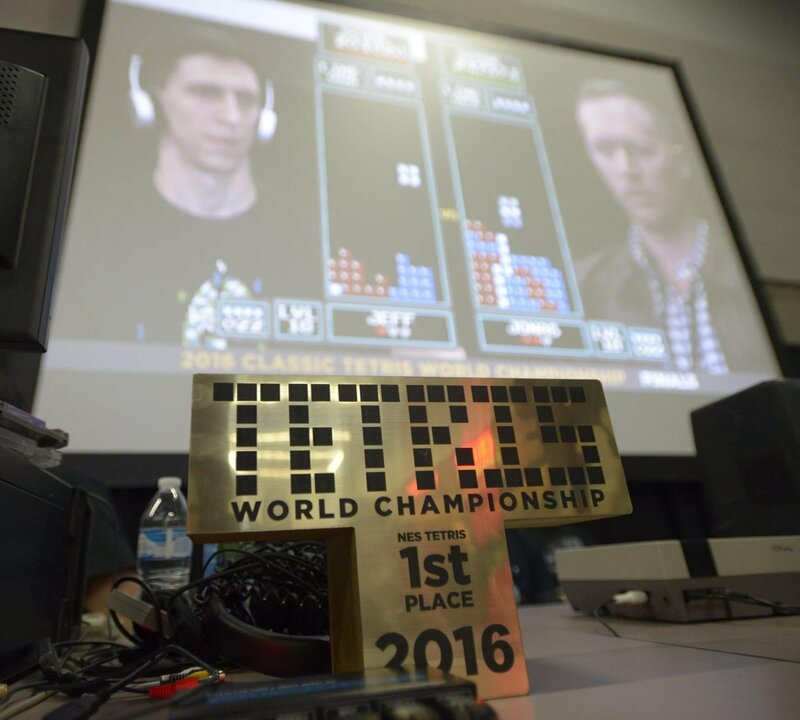 It followed several pro Tetris players as they prepared to compete in the first ever Classic Tetris World Championship (CTWC). 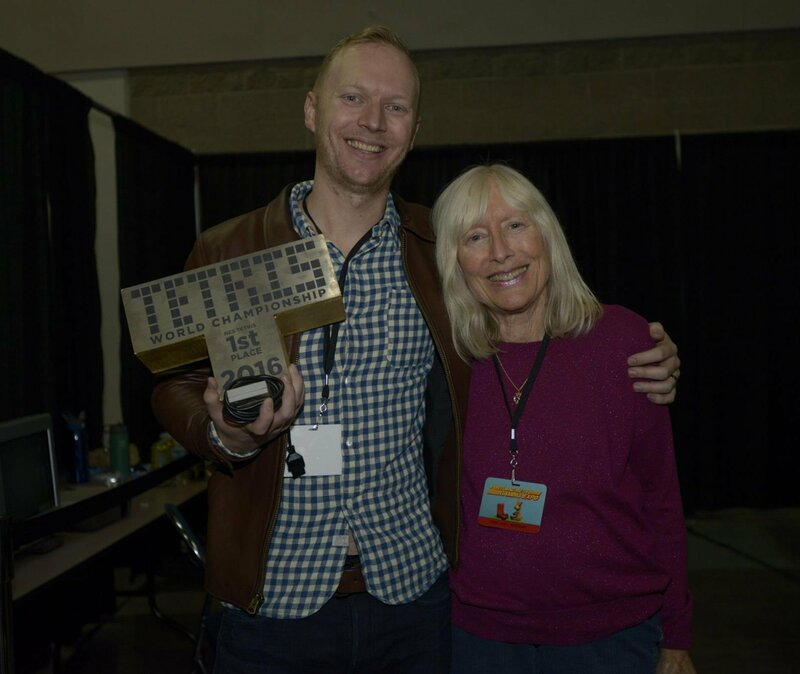 The documentary’s producer, Vince Clemente, has an intimate knowledge when it comes to the world of Tetris tournaments, as he continues to head the CTWC year after year. We know that Vince has seen many Tetris masters enter the CTWC halls, and that he advocates for Tetris as a proper esport. But what do we know about Vince Clemente himself and his personal history with Tetris? To find out more about this key player in the world of Tetris tourneys, we decided to interview Vince and learn more about the man behind the CTWC! Q: First, can you tell us a little bit more about yourself and the first time you played Tetris? What platform was it on? A: I've always been a big fan of the original Nintendo version. It came out when I was the right age, 8 or so. I remember Tetris being one of the first games we got for the system, along with Super Mario and Zelda. I have the fondest memories of the whole family sitting around and playing Tetris together, taking turns. It was the only game we could all enjoy! The day we figured out that you could hold down the A button and go ten levels ahead was a great day. Back then, it was more about how long you could last rather than points like it is now for me. I actually went on to start collecting all the original Nintendo games. I later achieved completing the whole Nintendo set, complete with boxes and manuals for all the games. It's close to 800 some games. Q: When did you know you were hooked on Tetris? A: I mean, you know you're hooked when you start playing in your dreams whether it's day or night, haha. I believe doctors call this Tetrisizing. Q: How did the CTWC form and what is your involvement? A: The first CTWC back in 2010 started when I got involved with Adam Cornelius's documentary, Ecstasy of Order: The Tetris Masters. He was based out of Portland, Oregon, and wanted to have the CTWC in Los Angeles where some of the best players—Harry Hong and Jonas Neubauer—lived. It was my job to produce and direct the first CTWC. Little did I know 8 years later I'd still be doing this! Q: How has the CTWC grown over the years, and do you have plans to expand the tournament even more in the future? A: CTWC has grown every year since it started; it's really been amazing to see. We do our best to improve the tournament each year. It took a few years to get it to where it is now, but we finally have something that is truly incredible. It's definitely my favorite time of the year along with all the players that make it out each year, year after year. To answer your questions, it's expanding every year. Who knows where it will stop. 3 years ago we added Trey Harrison to our team, and what he's done to take the video projection to the next level is truly astonishing. He wrote some amazing software that takes the SD game and basically redraws it in HD in real time. It's a total marvel to the retro game scene and I really think it's the future. Have you seen our overlays? Wow! This year we're working on some things to improve it as always. I'd say when we moved it from LA to Portland and changed the format from 1 day to 2 days and allowed 32 competitors to compete was a huge move in the right direction to where we are now. If you look at the top 32 scores over the years you see an improvement in all the players and more players year to year. It's a really hard competition to get into. I think last year the 32nd score was a 550k. And if you look about 10 years ago at the high scores for NES Tetris, that score would be in the top 10. We also have seen tons of max outs since the tournament started. In 2010 there were 3 known people in the world that had maxed the game out. Now there are more than 25, just 8 years later. So this tourney and the film have definitely sparked the interest in the game at a high level of play. Most of the 25 max out players come every year. Last year we had players from all around the US as well as Japan, Finland, and Australia. So, from a technical aspect we improve it every year, and from a player's performance standpoint, it improves every year as players get better and better. 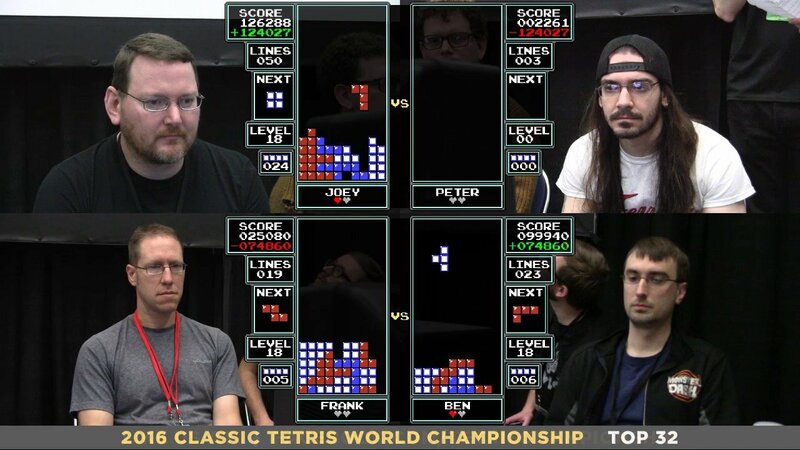 Q: Why does the CTWC use Tetris NES for the competition? A: We view the NES version of the game as nearly perfect. There are a couple other versions of the game that come close, and we've had a few side tournaments for those. It's all about what the players want and what makes for a good/fair tournament. A lot of the Tetris games do look the same, but play totally different. They each have their own set of rules. 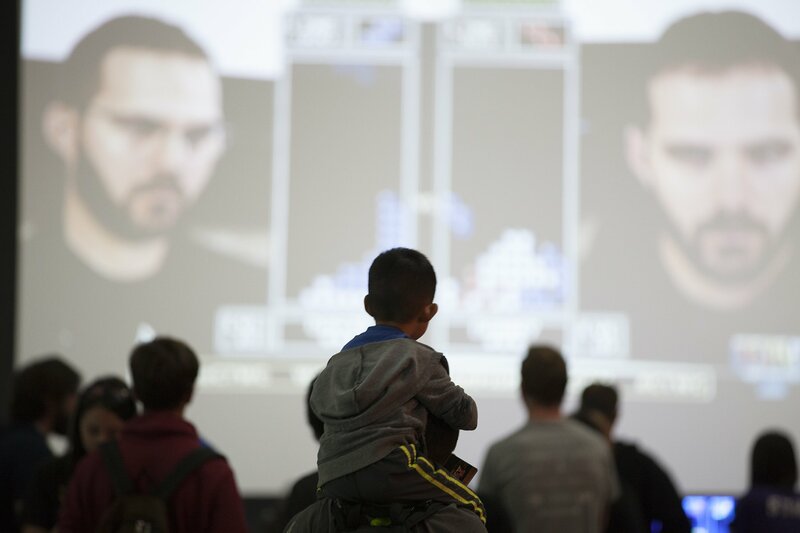 Lots of our players only play NES Tetris, so if it wasn't on that, they likely wouldn't come. Also, it's my personal favorite. Q: What’s the craziest play you’ve ever seen at the CTWC? A: My favorite play was actually at the European championship a few years back. Jani versus Linus in the finals, you [see] him start screaming and yelling as he's trying his best to survive. It's exactly what we are looking for as far as making this a sport, which it is. If we were to keep this in just the CTWC I would say Harry Hong's game 3 comeback victory against Bo Steil to advance to the championship he ended up winning. He truly pulled off a Tetris Miracle. Q: Do participants ever warm up before the competition? If so, what are some interesting ways you’ve seen people prepare for the CTWC? A: Some do, some don't. Lots of them come in pretty quiet and ready to compete, not really talking to one another, and keeping their focus. Others are all chatting and all smiles. Last year on one of the practice stations pre-tourney Harry just willy nilly threw down a max out, no big deal. One of our competitors Elijah Markstrom actually practices what looks like some kind of Buddha Zen Yoga like meditation before his matches. I've seen him sitting indian style on a table with his hands extended harnessing the power of the Tetris gods. Q: Where does the CTWC take place, and how can Tetris fans participate? A: Everyone is welcome to come! 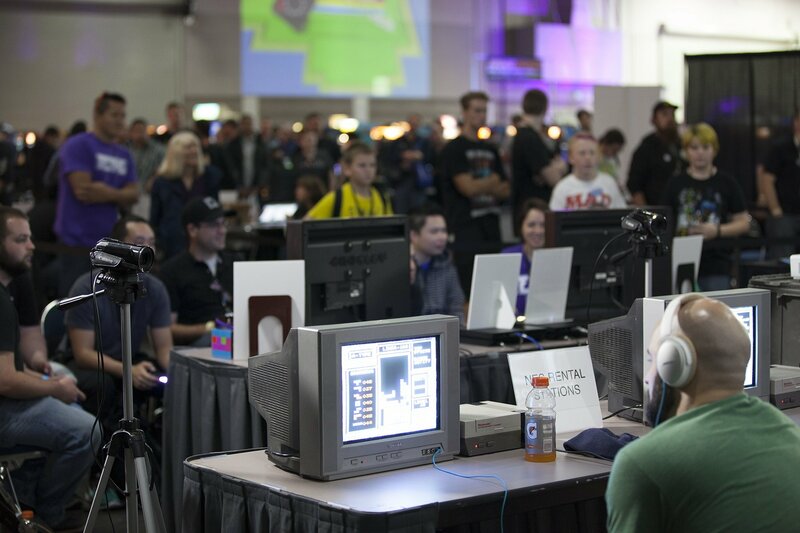 It takes place in Portland, Oregon at the Portland Retro Gaming expo. It's been there for 6 years since we moved it from Los Angeles. The tourney takes place over 2 days, this year on October 21st and 22nd. Saturday is the qualifying day, so anyone can come and try and get one of the top 32 scores which gets them a spot in the seeded tournament the following day. We have also started expanding to other game conventions around the US where they host a CTWC qualifying event where the winner gets sent to Portland to represent that part of the nation. 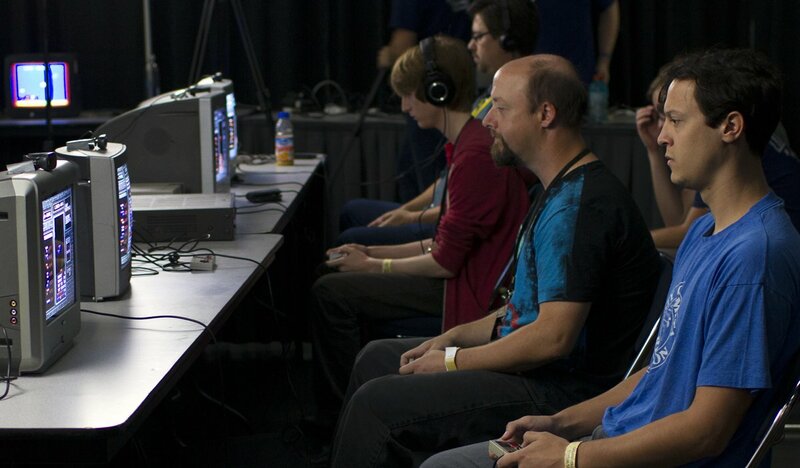 Last weekend Chad Muse won the CTWC Southern Qualifier at the Let's Play Gaming expo in Texas. This upcoming year we might have a qualifier in Singapore where the winner will compete in the CTWC in Portland, as well as some other qualifiers around the US. These winners get guaranteed spots in the CTWC for winning their respective qualifying events. I'd [follow] along on our Facebook page for announcements about the tournament as well as new qualifying events. Q: What kind of prizes can Tetris players win at the CTWC, and how did you settle on that particular prize to give out? A: The CTWC grand prize has been 1000 dollars and a sweet trophy the last few years. Honestly, though, I'd love to see the top 32 get some compensation like in golf or any other sport like this. We settled on this because it's really pushing our budget to the max for what we can afford, and the winner definitely needs something. We're doing our best to legitimize this as a pro sport. We are right on the cusp. Plus, there are those donuts we always have something from our sponsors to give the top 32 players as a thank you for coming! Q: You produced a documentary called Ecstasy of Order: The Tetris Masters. Can you tell us a little bit more about what the film is about, and what it was like to work on the film? A: The film is about finding the best Tetris player in the world, which we did! You get to meet all the top players, pick your favorites, and then watch them compete in the very first CTWC. The film was an absolute blast to work on. The best part of all of this is all the friends and community that the movie and the CTWC have created. It truly is a wonderful thing to be a part of. Q: Who’s the best Tetris player you’ve ever seen come through the CTWC and why do you feel they’re the best? A: You can't really argue against Jonas Neubauer being the best. He's won 6 of the 7 CTWC's and really sees the game differently than a lot of people. He plays extremely clean and has a lot of interesting burns that you don't see a lot of the other players do. He never seems to be in any kind of trouble. It could be his calmness that's the secret to his Tetris power, or maybe it's his hot threads, or maybe it's his secret weapon, his mother, who's always there. I bet everyone just lets him win because of that. This year we have a player coming back from Japan to compete, Koryan, and what I've seen him do while streaming recently is pretty crazy. I think he has a fair shot at taking the title out of the US for the first time. All the players seem to be pretty scared of him and his hyper tapping. Q: Do you play a lot of Tetris in your spare time? A: I do. I try to play a couple times a week just to relax. I played a little before my involvement with the movie, but then really picked it up after that for the last 8 years. It's hard not to play, it's an amazing game. Q: Have you ever competed in the CTWC yourself? If so, how did you do? A: I've competed in the last 6. I'm not as good as some of the top 16 players so I don't see myself ever winning or getting too far, but winning a round would be nice. I did take a game against Chad Muse once, and that felt amazing. I just want to beat Chris Brady one year and then I can retire. Q: What’s your favorite Tetris game to play right now? A: I don't think my favorite will ever change from being the NES version, but I do like to play all the ones that come out. The Puyo Puyo combo with Tetris seems like a lot of fun. I also love the SNES version with Dr. Mario. Q: Is there anyone else in your family who’s also a huge Tetris fan? A: Everyone is a big fan of it! I don't think I've ever met anyone that would say, "Tetris, bah!" Q: What’s one of your favorite things about Tetris? A: I love that it's simple but complex at the same time, you can pick up a game and just relax and play. Plus you can put it down, if that's ever possible, after just playing one game. So, if you got 10 minutes to spare, you can squeeze a game in. Q: Lastly, if you had unlimited resources and time, how would you like to grow the CTWC? A: We'd love see this on TV where it deserves to be. I'd also love to see the players get some more money like they deserve. Our first place prize doesn't even cover the person's flight and stay in Portland for the weekend. I'd like to change that. From a video standpoint, we'd love to see it more like a football game, halftime show, player breakdowns, etc. Lasers and smoke machines would also be a welcomed improvement to any event! We definitely want Alexey at one of these, maybe this year! I know he'd love it. We want to thank Vince again for taking the time to speak with us. 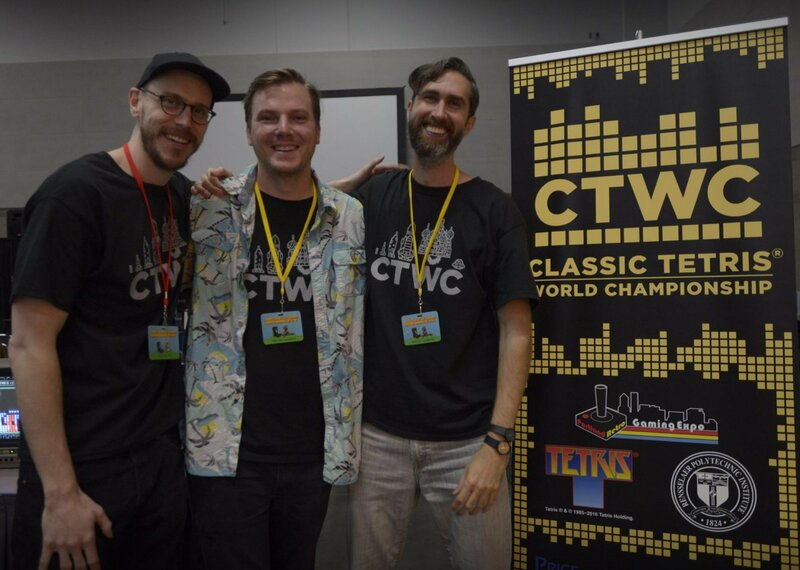 If you’re interested in either supporting or participating in the Classic Tetris World Championship, be sure to check out the CTWC website and follow the CTWC on Facebook. To learn more about the documentary Vince helped produce, head over to the official website for Ecstasy of Order: The Tetris Masters! If Vince’s insight on the Tetris competitive scene has put you in the mood for a little Tetris practice, no worries, we’ve got you covered! Click here to play a few rounds of Tetris right on our website.